In a time of worrying American health statistics, some states definitely have it worse than others. On many measures of health and health system performance, Oklahoma ranks near the bottom of the list – or in the case of fattest states, near the top. 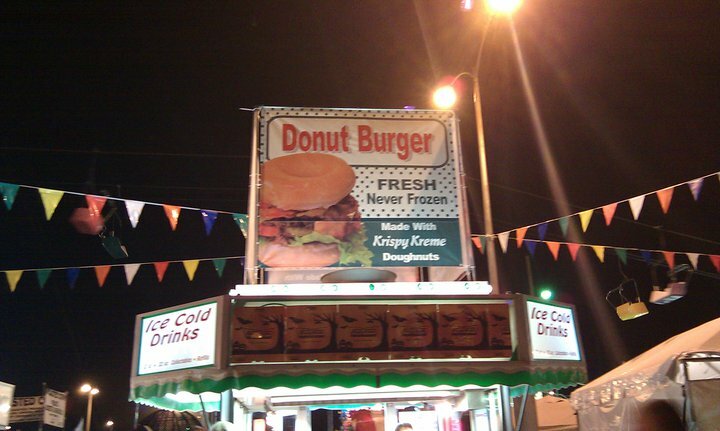 At his talk for the MacLean Center Seminar Series last month, Gerard Clancy illustrated his state’s health woes with a collection of photographs from the Oklahoma State Fair, including the “donut burger” and the elegantly direct deep fried butter. As Dean of the College of Medicine at the University of Oklahoma-Tulsa, Clancy’s immense challenge is to find new ways of improving health in this decidedly unhealthy setting. To do so, Clancy has overseen a dramatic change in the medical school’s curriculum, mission, and even name, rechristening the program as the OU School of Community Medicine. Clancy and colleagues redirected the school to focus on health care access and training medical students in primary care and community health, all in the context of national health care reforms and their new emphasis on reimbursing quality over volume. That plan revolves around new community efforts, particularly in the poorer neighborhoods of North Tulsa, where life expectancy lags 14 years behind the more affluent south half of the city. Deploying the “Starbucks model,” Clancy said the school is trying to build health care access points on every corner, with more than 300 doctors working at over 50 sites. As a hub, the school broke ground on the Wayman Tisdale Specialty Health Center, named for the college basketball great who died of osteosarcoma in 2009. But in the week before the groundbreaking ceremony, Clancy said the school learned a valuable lesson about not forgetting the “community” in community health. A newspaper ran a front-page editorial headlined “Is Tulsa North Being Pimped by OU?,” which challenged why the university was only providing health care without addressing social determinants that create poor health: lack of education, jobs, and other services. In response, the school “changed its architecture,” Clancy said, by linking to broader determinants of health, such as urban design, education reform, economic efforts, and early childhood development. Now that the OU School of Community Health has addressed its local challenge in Tulsa, a larger one awaits Clancy as he negotiates with the conservative leadership of his state. With a new governor and many state legislators winning 2010 races on a platform of repealing federal health care reforms, Clancy has started his attempts to make the case for the benefits of those changes in Oklahoma, where there are roughly 650,000 uninsured in a state of 3.1 million. “My greatest frustration is that this is not about logic, this is not about what’s best, this is still a political maneuver. Unfortunately, health care is being played as a pawn in political movements, but we need to make it a moral issue,” Clancy said.